Dr. Martin was born and raised in Newfoundland. 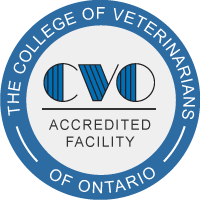 After obtaining his Bachelor of Science from Dalhousie University in Nova Scotia, he pursued his dream and graduated from the Ontario Veterinary College in 1997. Since then, he has practiced small animal medicine in Barrie. He recently joined the team at Aldergrove to continue to fulfil his foundational belief in practicing good medicine and providing outstanding care for companion animals. His overwhelming love and connection with animals and his calm, caring bedside manner keep his clients and his patients happy and comfortable. In his spare time Dr. Martin enjoys off road and adventure motorcycling and spending time with his wife Debbie. 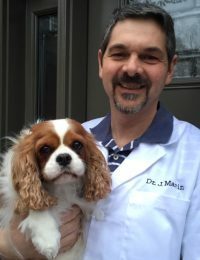 Dr. Martin has shared his home with many pets over the years, and currently enjoys the company of a delightful aged cat named Minnie, and a Cavalier King Charles Spaniel, Miss Taylor.